Has this ever happened to your bible? 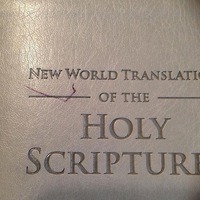 Any book that is well loved shows wear, and that is especially true of your New World Translation Bible. As you work in field ministry to teach others the Truth, you open it often to share the scriptures. Avoiding accidental smudges from your pen or fingers can help keep the pages clean, a sign of respect for your beloved NWT Bible. Making sure that your hands are spotless when you turn the pages makes a good impression on your listeners. The respect that you show for your NWT Bible is something that everyone you speak to in your field ministry is likely to remember. Proper preparation usually increases poise and confidence, which are essential in a presentation. Naturally occurring oils in your fingers can damage the delicate beauty of the pages in your NWT Bible, leaving unsightly smears. Cotton gloves are the option of choice for many. Their clean appearance reflects the respect that you have for reading God’s word. Impressive on your hands, they convey the seriousness of your desire to reach all of God’s children. Getting caught in the rain or a snowstorm makes planning for the protection of your NWT Bible, beyond cotton gloves, essential. Dampness can damage the lovely silver edging on each page, leaving spots that are usually impossible to remove. Pages that get wet can never lie flat again. Once that happens, there is no way to restore them to the pristine appearance that they had when they were new. Our Transparent Zipper Cover for New World Translation Bibles can allay all of your concerns about protecting your precious book. New to our product line, the NWT Bible cover has a sleek look, stylish appearance and protective qualities. Made of the finest materials, the thick, high-quality plastic cover fits snugly on your pocket-size or regular-size NWT Bible. The transparent plastic lets your Bible’s cover show through, and a colored fabric zipper provides a sophisticated closure that is classy and strong. How have our Bible covers helped you to protect your precious Bible? Let us know in the comments below!